"The Lodgepole Pines at Leigh Lake, Grand Teton National Park." While hiking along Jenny Lake in Grand Teton National Park, I noticed the shapes of the lodgepole pine trees along the way. 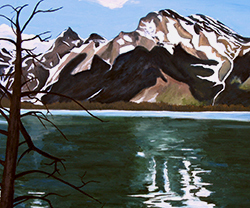 They were so beautiful that I was inspired to paint them along with the beautiful Teton Mountains, Jenny Lake, and the lonely little tree that lives in the middle of the lake. The trees were my real moment of bravery in this painting. As with anything in life, painting always makes you face a moment of bravery- a choice between things being pretty good and great. In the end, I think that it was worth the risk and after almost a whole tube of cobalt green, I'd like to think that I captured just a bit of the beauty that God made exist there.